Unfortunately, The ceilings were something of an afterthought. Clearly I should've done the ceilings before I put in all of that expensive hardwood. But then I had no idea that I would arrive at this point . 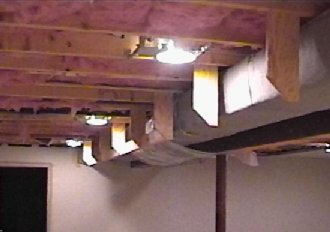 The problem with that I wanted to solve with the choice of ceiling material was (beside the obvious) to preserve the better acoustics that we had with exposed floor joists stuffed with insulation. Once I put drywall over all of that it would create a room that is too "live" for a serious stereo, TV, party, etc... I could go with acoustic ceiling tile, but I didn't want to lose too much height and I hate seeing those ceiling grids! 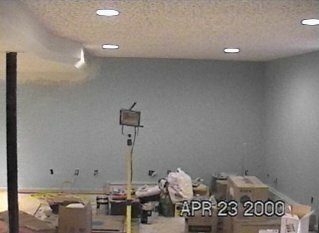 In retrospect, an acoustical covering over drywall probably would've been a good choice, but instead I found a ceiling tile that hid the grid, and a clip that left height loss minimal. 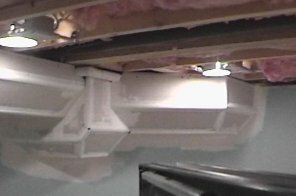 Now the only problem was to finish the protruding beams and duct work to make it less ugly. 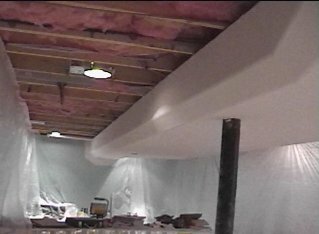 To box in the beams/ductwork, I opted for a technique creating a plywood rib skeleton, and then framed between the ribs with toenailed 2x4s. By the time all of the 2X4s are added, there is plenty of wood to form the backing for nailing the cornerbead on to create the same rounded bullnose corners that are everywhere in Atlantis. You can just about see a couple of the 2x4s start to fill in at left. 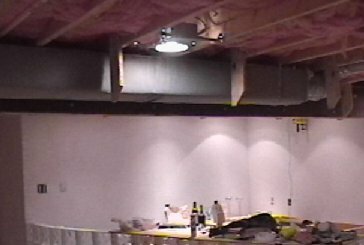 Here's the ductwork on the diagonal wall. It was a bit more complicated, requiring not only the plywood skeleton, but also a plywood box. This took a lot of staring to put up. 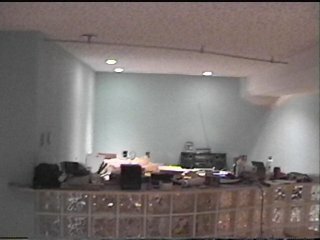 Ultimately this is all covered in drywall and it is already starting to look better. 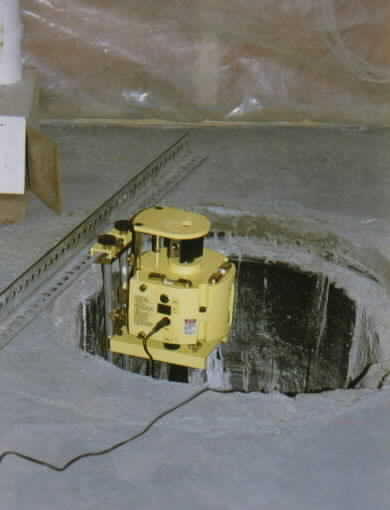 Now the cornerbead gets nailed in. This is why it was important to have all of that wood. 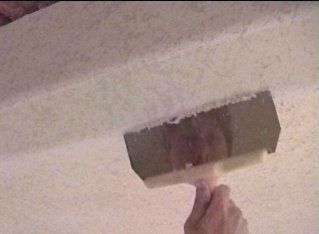 The cornerbead is plastic and can be bent to form 45 degree corners (instead of the preformed 90 degree) if there is something solid to nail it into. After the cornerbead is smoothed over with joint compound and sanded, it looks quite natural and with no sharp edges. Now for the texture. 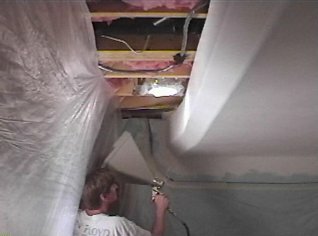 This involved using compressed air and this "hopper gun" filled with joint compound to spray globs onto the drywall surfaces. This is a messy job, so we created huge tents out of plastic to prevent joint compound from getting everywhere. Next, the globs are flattened lightly with a broad taping knife to make a subtle but readily apparent texture. This is the same technique as on the walls, and it greatly enhanced the painting later on - even giving the fish a more interesting look close up. The reflection proves this is either me or a twin. As the ceiling tile goes up, the grid disappears - replaced by a seemingly random pattern. 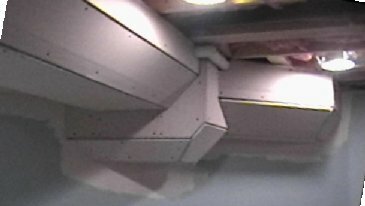 By the way, that horizontal rail (monorail) hanging from the ceiling is to mount very interesting lights from a company called Tech Lighting. I need to point out that I pretty much killed my rotary laser installing one of the three supports that hold up the monorail. 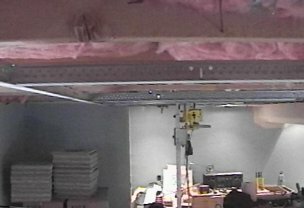 I had the laser nice and plumb underneath the support to mark exactly where I would need a small hole in the ceiling tile, when the support hardware fell four feet right through the lens of the rotary laser. (ouch!) It turns out that the lens had simply come unglued. After gluing it back and in a moment of panic, the folks at Laser Tools Co., told me the secret to getting it accurate again. Here's the completed pre-painted view of the TV area.